Once inside, we had a dressing station. I made Hogwarts capes (I think they look like graduation gowns, but whatever) out of duct tape and black plastic tablecloths. I got 3 out of each one, and they were pretty decent looking for the pictures, but the boys tore them to shreds, so I wouldn’t waste your time, if you’re also about 10 years behind the times and having a Harry Potter Party even though it’s 2013 (or later). We also made wands out of dowel rods that we used hot glue guns to make look more “wandy” and then spray painted. I used Rustoleum Hammered Finish spray paint and it did a really great job- the wands turned out really well, and I was very happy with them. Super Grammy also made Gryffindor scarves from red and yellow fleece. 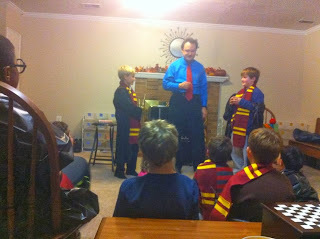 Once they were dressed for the occasion, we did a short potions class (I made flaming basilisk skin, foaming truth serum, and ooblek) and then the boys had a Hogwarts feast. Of pizza. We did serve everything on gold chargers and had lots of candles, and there was, of course, butter beer and pumpkin juice (we re-labeled some V8 Splash). We did a candy store display for goody bags that included chocolate frogs (I filled mine with green marshmallow fluff) and boxes, “every flavor beans” (just mixed Jelly Bellies), golden snitches (Ferrero Rocher chocolates with wings), acid pops (blow pops with pop rocks on them) and glow wands (just glow sticks). The high point of the party, though, was definitely the entertainment, though. I found a new website called Thumbtack, which allows you to request quotes for local services, and it was awesome. I put in that I needed a magician, entered a few details (size of the party, age of guests, theme, date/time) and within minutes had responses from several magicians in our area. I was actually quite nervous about having a magician since the kids were all going to be 4th/5th grade and I wasn’t sure if they’d like it or think it was completely lame. When people respond to you, they’re able to include a brief note along with their price. Magician Michael Chamberlin stood out to me because he noted that older children need “more sophisticated” humor and tricks, and he also clearly read my note that it was a Harry Potter party because he offered to open with a trick featuring one of the books from the series (Harry Potter and the Goblet of Fire). The other part about hiring a magician that made me nervous was that our party was Friday evening, and our magician was going to have to take 95 south to get there. In what was perhaps the best magic of the night, he arrived on time, though, and came in through our back gate so he could set up without the kids even knowing he’d arrived. It was a great surprise for our birthday boy. They’re only little once, right? All opinions, including the awesomeness of Papa Johns by candlelight and the magic show, are my own. I was not compensated or provided with a discount, or even asked to write anything, although if Papa John wants to start throwing some of that money he’s giving out to Football players my way, he can totally email me anytime.